Little, Brown Books for Young Readers, 9780316531207, 208pp. Sally Miyake can't read, but she learns lots of things. Like bricks are made of clay and Vitamin D comes from the sun. Sally is happy working in the kitchen at Sunnyside Plaza, the community center she lives in with other adults with developmental disabilities. For Sally and her friends, Sunnyside is the only home they've ever known. Everything changes the day a resident unexpectedly dies. After a series of tragic events, detectives Esther Rivas and Lon Bridges begin asking questions. Are the incidents accidents? Or is something more disturbing happening? The suspicious deaths spur the residents into taking the investigation into their own hands. But are people willing to listen? 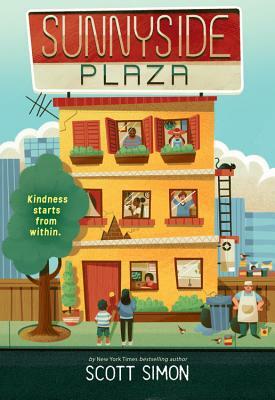 Sunnyside Plaza is a human story of empowerment, empathy, hope, and generosity that shines a light on this very special world. Scott Simon has won every major award in broadcasting for his personal essays, war reporting, and commentary. He has reported from all fifty states, scores of foreign countries, and eight wars. He hosts Weekend Edition with Scott Simon Saturday mornings on National Public Radio (which the Washington Post has called "the most literate, witty, moving, and just plain interesting news show on any dial") and numerous public television and cable programs. He currently resides in Washington, D.C.